It is really natural for people to forget things easily, let alone to say complicated passwords. Every now and then, we’re asked to sign up an account for forum, community, social media or even online shopping. Passwords like names, mobile numbers and important dates can be easily guessed by anyone. Moreover, the same password to access every website is highly dangerous. What if there is a manager to remember the passwords for us? As this world is advancing, we are more conscious of our online security while on the other hand, and more dependent on technological resources. So, it is extremely important to choose the best password manager as there are many options available. You must look for the most trustworthy and authentic platform. Chrome Password Manager, added to Google Chrome since Version 69, is a highly powerful and safe password manager. Pro tips: It is also vital to know how to recover files from computer hard drive in case you mistakenly deleted useful files downloaded through Google Chrome. The best file recovery software should be able to undelete photo, video, audio, PDF, Office document and more other files. Here is everything you need to know about Chrome Password Manager. 1. Compatible with every device: Google Chrome is familiar to everyone. It works well with almost every operating system, namely Windows, Android, Mac, iOS, Linux or any else. Of course, you can also find password manager for Android only or other platforms easily. 2. Easy access: People can easily switch Chrome Password Manager on and off as per required. 3. Generates strong password: Users often put random and relatable password which is not at all safe and easily forgettable. It is important to have a safe and rather strong password on every website you access so as to avoid any hacks. Google has brought the basic and easy criteria which have made the users take responsibility for their own security. It can be easily done by creating the password using at least one lowercase, one uppercase, one special character, and one digit. However, it is not recommended by Google by default, but Chrome Password Manager generates the password as required by the website smartly. 4. Highly secured: Chrome is a prominent browser used by everyone for mostly accessing social media sites, banking websites, e-commerce websites, and other regularly used web portals. So, high security is significantly required in Chrome. Google provides a link to its every user to introduce them to their high-tech setup. Google aims to protect their users from hackers and other unwanted disruptions. Chrome browser syncs all the updates regularly to the cloud and gets a security update of its users after every six weeks. In case of any critical interruptions like site isolation, sandboxing, etc., it renders helpful warnings to its users and fixes the bugs within 24 hours. The best part of these actions performed by Chrome is that it is done automatically. Users can go through the details provided by Google to know more about it in a better way. If the Chrome Password Manager is not enabled by your browser by default, you can set up it manually. You can also disable it whenever you want. Step 1. Open Chrome browser, then click your profile icon on the top-right corner. Step 2. On the pop-up menu, click on Passwords. The password settings page will appear. Step 3. You can switch it on or off with Offer to save passwords. Step 4. Auto Sign-in option is on by default. If you turn it off, you will be asked for confirmation every time. Under the Saved Password section, you will see the list of websites that Chrome Password Manager has recorded. The working of this manager is simple, secure and highly reliable. Chrome Password Manager gets in action to check your every sign up on a new website and recommends a strong password. It will pop-up a message if you enter any general term or relatable password. At the completion of this process, the password will be saved to your Google profile. Moreover, it also notifies the users if they use the same password for every website. You can save your password so as to autofill it for quick access using Chrome Password Manager. Chrome Password Manager provides an easy, efficient and trustworthy way to save passwords. You can also manage your saved passwords on the go, wherever and whenever you want. This can be done by visiting Google Passwords section of your account. 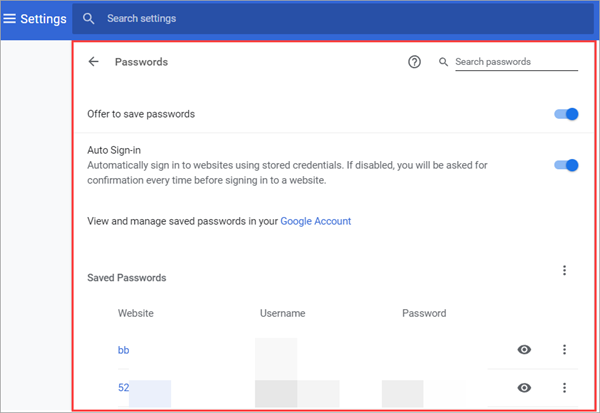 For this, you just need to enter your Google account password to sign in to your Google account and easily access all the passwords saved by the Manager for your convenience. You can view, edit and delete any password associated with the site and linked to your Google account. You can even go for ‘Never for this site’ option to not to save password of that particular site ever again. 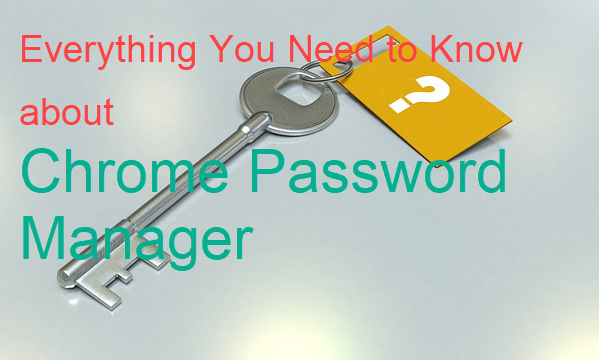 As you are saving all your important passwords using Chrome Password Manager, it is highly recommended that you have a very strong password to access your Google account. You must also avoid logging in your Google account on public networks or any other unknown random platforms for safety purposes. Now you have known the utility of Chrome Password Manager. This Manager developed by Google has made the life simpler by saving and securing the passwords of various sites. Furthermore, it enhances the data security with automatically generated warnings and recommendations. It is easy-to-use and can be accessed using any device with Chrome browser. With its high usability and secured services, it is widely used as a technological aid for security of data online.